I knew that we planned to run the Hope Endures Virtual 5k today so last night I used Map My Run to design an out-and-back 5 km route from the marina to the centre of our town and back. It was gloomy and nippy. Just the kind of morning that makes you feel like you need to get going to really warm up! We were running in honor of Courtney's infant daughter, Ashlyn, who passed away on December 2, 2008. The Captain was also thinking of his Dad, who was born on December 5th, and who passed away in February of 2009. And today is also the second birthday of my darling grandniece, Nahla. A real mix of emotions going on, and very little chit chat on our run today. We did the first half in 17.5 minutes then turned around, had a 1 minute walk break and started running back. Total time - exactly 37 minutes. Not my fastest 5 km but the best I had in me today. I was glad to have The Captain with me as he always pushes me a little bit. After we stretched, I made us both smoothies with chocolate protein powder and bananas... very nice and thick but not quite as tasty as they are with just plain chocolate milk. Sounds like a very emotional run today. Great job on another virtual 5k! Great job getting it done and honoring so many people. What a beautiful run....I think I love the pace because it gave you the time to really honor the people you were running for. yes...definitely sounds like a mix of emotions but what a great way to honor all of them with a run together. i am sure it was a special run! Great job! I got my run in today. I still need to make myself a chocolate banana smoothie! Very touching tribute, and great that you got to share it with the Captain. sounds like a great run! and not all runs have to be races ;) even though, I guess this was a race :) lots of feelings going on. I'm a december baby myself. great job finishing such a powerful race! Fun! And what a beautiful cause. 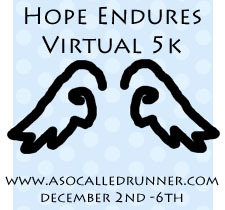 I have never done a virtual 5K, but now I want to! what a great race you all run and that you had another to honor in it. Means a lot that you ran it with me in spirit, thank you!